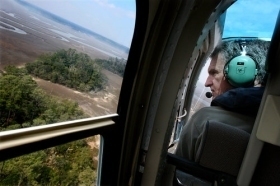 When Jim Ozier takes to the sky next week to check bald eagle nests, the support of Georgians who donate through the Georgia Wildlife Conservation Fund state income tax checkoff goes with him. Ozier, a program manager with the DNR Wildlife Resources Division’s Nongame Conservation Section, has been monitoring eagles for as long as the “Give Wildlife a Chance” checkoff has been around. Started in 1989, the checkoff has contributed more than $6.5 million to the Wildlife Conservation Fund, created by law to conserve Georgia’s nongame wildlife and natural habitats for future generations. The donations have made a difference. For example, the fund helps pay for bald eagle surveys. These surveys document nests and fledglings, even helping landowners work through management issues. Ozier counted 143 occupied nesting territories last year. In 1990, the state had only nine. “It’s a good investment of checkoff dollars,” Ozier said. This tax season, consider giving 2 wildlife – contribute $2 or more to the Wildlife Conservation Fund on your state income tax return. The more who give as little as $2, the larger the impact on the some 1,000 Georgia plant and animals listed as species of conservation concern, from bald eagles to Rafinesque’s big-eared bats. Ozier flew much of the state in January to find occupied eagle nesting territories. The helicopter flights starting next week will survey numbers of fledglings. Similar survey data played a key role in the 2007 decision to remove bald eagles from the federal endangered and threatened species list. Fill in $2 or more on line 26 of the state’s long tax form (Form 500) or line 10 of the short form (Form 500EZ). The amount will be deducted from refunds or added to payments. In the U.S., TV shows featuring exotic venomous snakes like black mambas and king cobras fascinate us. 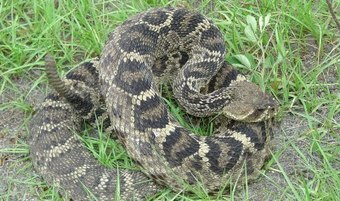 But internationally, rattlesnakes – found throughout Georgia – draw the same if not stronger attention. Besides the wow factors of danger and size – eastern diamondbacks, the largest rattler, can top 13 pounds and 6 feet long – one draw is the rattle: a creation of dry skin capable of warning away potential threats. “I can’t think of any other snake that has that … adaptation of a tool built into the body,” said Jensen, who works with the Nongame Conservation Section. There are 32 rattlesnake species, all native to the Americas. Georgia has three: eastern diamondback, canebrake (also called timber) and pigmy. The eastern diamondback, confined to the Coastal Plain in this state, is North America’s largest venomous snake. The species also is in decline. Eastern diamondbacks and other rattlers will attract local and international visitors to this weekend’s Claxton Rattlesnake & Wildlife Festival. For the first time in the event’s 45 years, organizers will exclude buying and selling wild-caught rattlers. The focus on wildlife and conservation has been expanded. Jensen will help manage rattlesnakes borrowed from captive sources for the festival. It’s an opportunity for him, like others around the globe, to thrill again at one of the world’s most unique snakes. Don’t forget: The Fitzgerald Wild Chicken Festival, which switched from a rattlesnake roundup years ago, is March 16-17 in downtown Fitzgerald. Explore the outdoors like never before with a free, new mobile app from Georgia DNR. Get maps, buy permits, even use GPS to track and share your adventures on state-owned lands with the Pocket Ranger® Mobile Tour Guide, available at Apple iTunes, Android Market or www.StateParkApps.com. Young artists and birders can test their skills in this year’s Give Wildlife a Chance Poster Contest, open to kindergarten through fifth-graders, and Youth Birding Competition, open to K-12th grade and set for April 27-28. Deadlines to enter: April 6 for the poster contest and March 31 for the birding competition. A new, $33 million partnership between the Natural Resources Conservation Service and the U.S. Fish and Wildlife Service will work with wildlife experts and private landowners to restore habitat on a regional scale for at-risk species. Working Lands for Wildlife will enroll participants through the Wildlife Habitat Incentive Program and provide recovery tools targeting seven species, including the gopher tortoise. The Georgia Shorebird Alliance, a collaborative of agencies, nonprofits and volunteers aimed at furthering shorebird conservation, kicked off with a Feb. 24 meeting held by the Wildlife Resources Division in Brunswick. 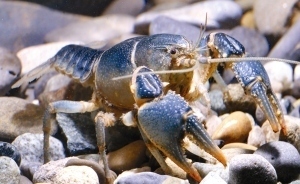 The Conasauga blue burrower, Cambarus (Depressicambarus) cymatilis Hobbs, has been documented in the Conasauga and Hiwassee river systems in northwestern Georgia and southeastern Tennessee. The species, colored blue overall, is considered endangered by the state and critically imperiled across its range by NatureServe. The Conasauga blue burrower grows to about 3 inches long, spends most of its life in a system of tunnels next to streams and, like other crayfish, feeds on almost any live or dead organic matter it finds or captures. Learn more about this rare species (pdf) and others in Georgia here. GIVE 2 WILDLIFE: Look for Georgia Wildlife Conservation Fund on your income tax form. $2 makes a difference!